I am just SO into the fall colors right now. I am loving the soft browns and greens with touches of reds and oranges! I found this great word art by Ali Edwards and digitally colored all the words using beautiful fall hues. Once I added it to my wood grain paper, I knew that fall leaves were needed to complete my card. These gorgeous Eyelet Outlet Leaf Brads were the perfect addition! It is a rare card that isn't improved by brads!! I also used some beautiful Pearl Bling to "attach" my banner. You can also find the bling at Eyelet Outlet. I hope you like today's card. I'll have another card for you tomorrow that uses some of this same paper - but in a very different way. So be sure to stop by tomorrow!! 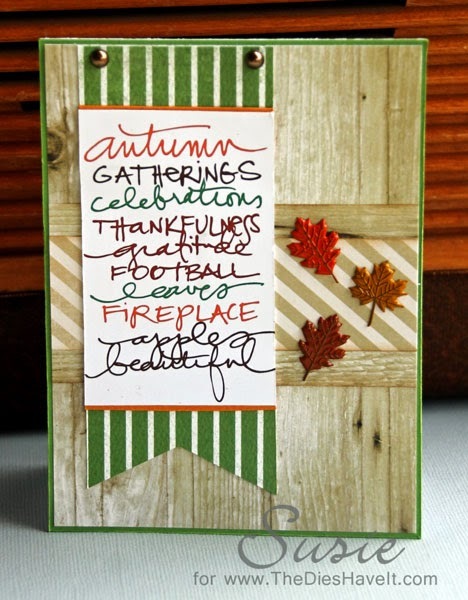 Love your darling Autumn card Susie and that sweet word art focal. Wonderful layout design and colors.